Everyone is called to be accountable in some way. Husbands and wives are accountable to be faithful to each other. Children are called to be accountable in their obedience to parents. Employees are called to be accountable to their employers and students are called to be accountable to their teachers. God sent His Son, Jesus Christ, to die for the sins of the whole world and masses of people never hear the gospel because we are afraid or timid to share it with them. By doing so, we contribute to their fate of eternal death because we withheld the truth from them. The Lord will hold us accountable for sharing the Good News with those who live or work around us every day. There are so many words spoken in a day that we hardly think about what we say. Yet the Lord doesn’t forget our meaningless words and we will have to give an account for each one. We know that we are to be “slow to speak” (James 1:19)—to help us carefully consider what and how we speak to those around us. Our everyday decisions matter to God and to those we live with at home, school, or work. We set the example of how believers reflect Jesus in good and bad times. Our attitudes and actions speak much louder than our words. We must live under the direction of the Holy Spirit being accountable to live righteous lives. “Have confidence in your leaders and submit to their authority, because they keep watch over you as those who must give an account. Do this so that their work will be a joy, not a burden, for that would be of no benefit to you” (Hebrews 13:17). Every leader will give an account to God for those who followed them in their lifetime. A leader must be sure that they’ve said and done everything as directed by the Lord so that people will stay on the right track. Followers will give an account as well in how they demonstrated patience and submission to those the Lord put over them. “Not many of you should become teachers, my fellow believers, because you know that we who teach will be judged more strictly” (James 3:1). Many lives are touched (both positively and negatively) by those who teach the Word of God. Teachers are given a gift from God that enables them to take the deeper truths of His word and make it easier for understanding and application by their students. This accountability comes with a greater judgment so that not many people should consider teaching unless they are called to do so. “But they will have to give account to him who is ready to judge the living and the dead” (1 Peter 4:5). The Lord makes the truth known in every place on the earth. People only have to look at the sky, trees, or rivers and they will know that God exists. However because of the hardness of their hearts, many will reject God and instead choose to live by their own rules. They will stand before God and give an account of rejecting His precious Son, Jesus Christ. We find in Jeremiah 17:9 that “the heart is deceitful above all things and beyond cure. Who can understand it?” Because of our ability to deceive ourselves into believing lies—we must remain accountable not only to God, but to others in the body of Christ especially those who are wise. 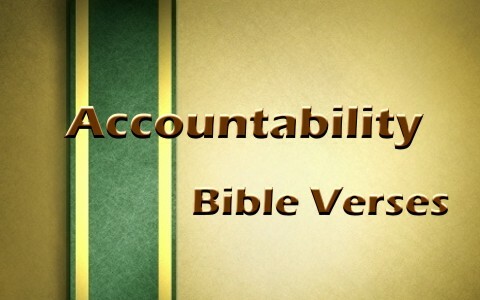 Accountability is a gift from God to help us stay on the right path and live spiritually successful lives. “…we are afraid or timid to share it(Gospel) with them. By doing so, WE CONTRIBUTE TO THEIR FATE of eternal death because we withheld the truth from them”(emphasis mine). I think we will be held accountable for having shared or not shared the Gospel with the unsaved…absolutely. I do not think that we will in anyways be held “responsible” in “contributing”(your word) to their fate. Do not misunderstand. We are “called” to support missions, share the Gospel, feed the poor, etc, “because” we are commanded to do so by the Lord(Mt 28:19,20). We will be held accountable for doing the work of a servant, which is our reasonable service(Rom 12:1). Salvation is the Holy Spirit’s job, though, and “IF” we do not share the Gospel with “whomever”…even though God is whispering for us to do so, that will not “seal” their fate. God will raise up another. Ultimately, our lack of sharing will not alter another’s eternal destiny. To believe otherwise, is to deny God’s sovereignty. You always make me think Crystal, and I thank you for that. I agree with your assessment. I don’t believe that we cause unbelievers to go to eternal death because of our refusal to share the gospel. However, we are accountable to share the Good News especially when the Holy Spirit compels our hearts to share. Being saved or lost–we have a responsibility to respond to the Lord’s beckoning. Thanks again for your astute observations. Have a blessed day. Where in the bible does it point to God holding us responsible for not knowing his Word? Let everyone, whether a Christian or not, be mindful about the truth that God will judge all of us and we shall give account of how we use whatever he has given to us here on earth. It may be your wife, children, your spiritual gift, your profession, money, or any other property you are in possession of. For this reason we must all be careful how we use everything that we have. Previous post: What Does Perseverance Of The Saints Mean? Next post: What Is The Spiritual Gift of Discernment? How Do You Know If You Have It?